Cases We Routinely Handle- Quite Well!!! He Knows the Central New Jersey Territory! Protecting Your Legal Rights Is What We Do!!! Contact Eric R. Schwab-Better Call ERIC! Ready to assist you with your legal needs! Hi, I’m ERIC SCHWAB and am the owner and founder of SchwabLaw.com. Located at 57 Green Street in downtown Woodbridge, New Jersey-near the Woodbridge Train Station. OK.. Nobody wants to be hurt in a car accident or at work but if it happens just call me. I’ll discuss the facts with you and assess whether or not you have a case. If so, I will take on your case and do my best to get you what the law allows. Will,Estates,Power of Attorney? Call Eric! Very Convenient and Inexpensive (See Below). Basic Legal Documents Every Responsible Adult Should Have. Get a Last Will and Testament. 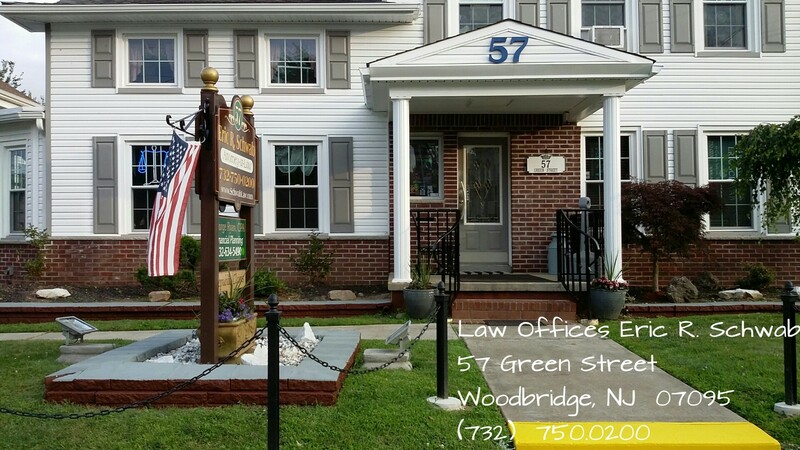 Located in Historic Downtown Woodbridge, New Jersey, our Office is equipped to handle a wide variety of legal services including Serious Personal Injury Cases, Workplace Injuries, Criminal Cases, Drunk Driving, Revoked List, Drug Possession, Municipal Court, Traffic Tickets, Juvenile Cases, Firearms Offenses, Business Services, Select Real Estate, Wills and Power of Attorney.